If you’d like to register for an iPad in Education workshop yourself, you can see what’s currently open for registration from CUE. Or, if you’d like to bring the iPad in Education workshop to your own site, district, or region, you can request the workshop via the CUEtoYOU professional development program. 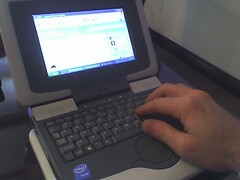 I’m typing on an Intel Classmate PC right now! I used to work with Steve Glyer at the Newport-Mesa USD. He is a board member for Computer Using Educators, Inc and is sharing with the board right now that he is running a pilot program with students at his district. It’s got a small keyboard, but it’s a full PC with XP, and it’s very rugged. I’m hoping to get my hands on a loaner unit soon. In the meantime, here I am typing on one at the CUE board meeting (with twitter on screen). I started this post on my laptop, but ran out of power. The following is composed from the moblogged notes I took on my treo. Beginning in media res, I found it interesting that the presenters noted that they have seen higher parent participation at the 1-to-1 schools because of laptop orientations they offered. More importantly, they offer what they call a TIP toolkit (or Technology Immersion Pilot Toolkit) for others considering a 1-to-1 implementation. This professionally designed document includes (among other resources) “TIP Factors” or “factors to consider before implementing technology immersion” and “TIPS for Success” or “lessons learned from their technology immersion pilot.” Though the presenters had the slides with the most bullets I’ve seen in a long time, I suspect the actual document will be a good resource for my 1-to-1 work with Salem School over the next year. I was happy to discover that their tips seemed very familiar based on my experience and reading on the topic so far. Frankly, though, it’s hard to focus on all of these elements during an implementation. I believe the key factor, the one that can help you overcome a shortcoming in any other area is stakeholder buy-in. Other bits that caught my attention in this presentation were the assertion that principals need time to learn, too! Also, they were explicit about the need to have a PLAN for staff turnover, something I learned the hard way during the EETT grant implementation that gave 1200 middle school students in Newport-Mesa Palm Tungsten E handhelds. Naturally, they also noted that curriculum integration and pedagogical support is at least as important as tech support. I was particularly happy to see them recommend using students for technical support. This session and the others like it left me looking forward to working in a 1-to-1 situation again soon. A Computer On Every Desk? Now What? 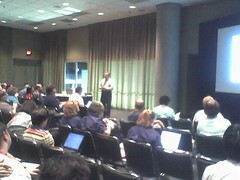 This is being live blogged during concurrent session one at NECC. In preparation for my 1:1 work with Salem, I decided to seek out sessions on 1:1 at NECC this year. I started upstairs in End-to-End One-to-One Computing Solutions: Engage Students and Empower Educators, but quickly realized it was a Gateway commercial (the first slide made this easy) and headed downstairs to A Computer On Every Desk? Now What?. On the way I went down the escalator with John Pederson and was very tempted to join him in Will’s session… he had a huge crowd, and like John I would’ve liked to have seen Will’s current presentation, but I opted for getting out of the echo champer after all. So I’m here with James Gates (no relation to Bill), who opened with some humor and then his goals for the session. Among other things he has something of an open source focus. Cool. He also offered political background on Pennsylvania’s move to shared WANs and shared services, including netTrekker, Internet2, Moodle, & podcasting services. He talked also about their professional development programs, and an effort to put a laptop for each kid in all of the core classrooms. Other context included news about failures of laptops (and educational technology) in schools. The first hurdle – students become stenographers. Don’t be afraid to say, “close the lid.” Train students on how to take notes. 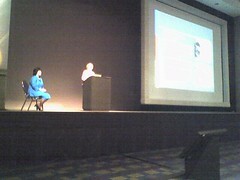 Next he talked about using Moodle (instead of Blackboard). And, cool, the kids have blogs in Moodle, but there are no comments. (This is sad… and arguably not a blog.) He demoed the blog feature a bit. They are now experimenting with using elgg in conjunction with Moodle – for better blog features and locker space. In addition to the Moodle submission tools, he’s using network shared folders for inboxes, outboxes, and shared folders. I suppose it should be comforting that I may be right in thinking that these tools are ideally suited for 1:1 implementations. Incidentally, he is acknowledging the “issues” related to these tools, but not letting them stand in his way. Now he’s talking about timeline.to , which creates visual timelines from RSS feeds. Here’s a timeline for this site. He said that in PA you can’t have public blogs in school, but “it’s a little better than pasted a word document on a wall.” This guy is great. This session is much more fun than I expected. With ten minutes left, he’s demoing some real classes (password protected, so no link, sorry). Hm. Then he returned to slides for his conclusion… and my own engagement went way down. I need to heed that myself. It’s a big room and I can’t hear the other questions so much… and it sounds like he putting off some questions for after. Oh! They don’t even actually have the laptops yet. Oh well, fun session anyway. There isn’t much there yet other than a typical workshop outline (complete with hotlinks… and lots of references to Pamela Livingston’s new book, 1-to-1 Learning: Laptop Programs That Work). I organized the rest of the wiki based on the California Tech Planning framework, so there’s sections for curriculum, professional development, infrastructure, funding, and evaluation. Despite the fact that it’s mostly empty right now, there was some cool wiki-ness happening Wednesday. I did the old “best hopes, worst fears” activity on a wiki for the first time, and we did an “in class” discussion on the wiki. The staff created a wish list already in the funding section, and we posted the results of a quick initial teacher attitude survey in the evaluation section. We haven’t moved the FAQ’s over yet, but here are the (slightly out of date) FAQs from their main website if you interested.